Arnold became member of the 17th "Nottingham" Beeston Boys Brigade Company and, after he left the BB, he joined the Beeston Old Boys Association. After his school years at Nether Street he joined the Collingham & Humber Works in premises located in the old Humber Works factory. He enlisted in the army at Nottingham and joined as F19899 in a battalion of the Kings Own Yorkshire Light Infantry. Arnold Wheatley later joined the 64th Company of the Machine Gun Corps, reaching the rank of Lance Corporal before falling on the first day of the "Somme" Battle. And, like thousands more on that fateful day, his body was never found. 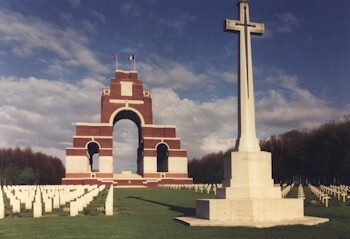 His name is commemorated among the 73,000 names on the Thiepval Memorial to the "Missing". He was remembered in the Beeston Gazette & Echo by "Grace, Ethel & Jack" from 141 Queens Rd, Beeston. The Machine Gun Corps is Created - On 2 September 1915 a definite proposal was made to the War Office for the formation of a single specialist Machine Gun Company per infantry brigade, by withdrawing the guns and gun teams from the battalions. They would be replaced, at battalion level, by the light Lewis machine guns. Thus, the firepower of each brigade would be substantially increased. The Machine Gun Corps was created by Royal Warrant on October 14 followed by an Army Order on 22 October 1915. The companies formed in each brigade would transfer to the new Corps. The MGC would eventually consist of infantry Machine Gun Companies, cavalry Machine Gun Squadrons and Motor Machine Gun Batteries. The pace of reorganisation depended largely on the rate of supply of the Lewis guns but it was completed before the Battle of the Somme in 1916. A Base Depot for the Corps was established at Camiers. 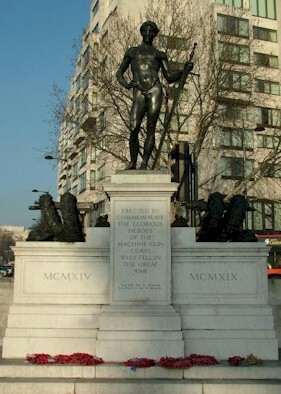 Show right is "The Boy David", the splendid memorial to the Machine Gun Corps in Hyde Park in London. "Saul has slain his thousands; But David his tens of thousands." 3Samuel Wheatley died in 1919, age 58. His widow is recorded in the CWGC records as living at 186 Queens Road, Beeston. 4Grace, Ethel and Jack can be identified as Arnold's siblings, 'Jack' being Atholl's everyday name.